Figure 1: Spinshuttle: Model of R3N@C80. 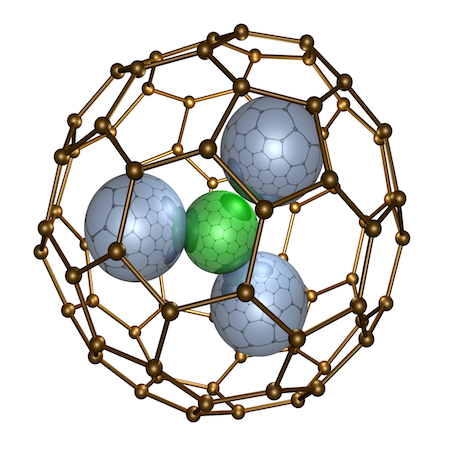 The 3 blue atoms R inside the carbon 80 cage are any combination of trivalent rare earth atoms, like scandium, yttrium, etc. For those R with an open 4f shell like holmium the molecules are paramagnetic and may display as single molecule magnets. Picture by Ari P. Seitsonen. The project "Spin shuttles" investigates molecules with unpaired electron spins in view of their performance in molecular spintronics. Spin shuttle is a term coined for endofullerene molecules that encage and protect an atom or molecule with an open electron shell. Such molecules are candidates for single molecule magnets and have a great potential as building blocks in molecular spintronics. A single molecule magnet is a single molecule that retains its magnetization direction for a long period of time, i.e. displays hysteresis. The first single molecule magnet spin shuttle was Dy2ScN@C80. Our experiments cover magnetic characterization of the electronic ground state with magnetometry and x-ray circular dichroism (XMCD). The structure of the molecules on surfaces is investigated by x-ray photoelectron diffraction (XPD), also with resonant excitation (RXPD) and tunneling microscopy (STM) and spectroscopy (STS). In collaboration with Dr. Matthias Muntwiler and Dr. Cinthia Piamontheze, PSI Villigen and Dr. Alexey Popov, IFW Dresden.